IZArc is the ultimate archive utility supports many archive formats It allows you to drag and drop files from and to Windows Explorer. 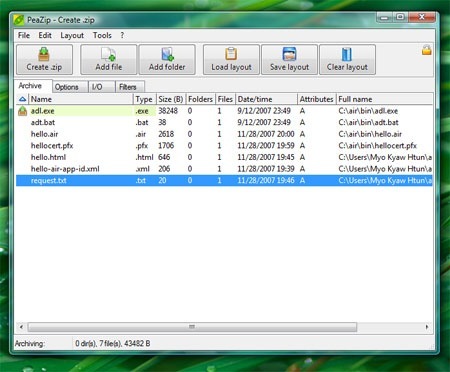 PeaZip can extract most of archive formats both from Windows and Unix worlds, ranging from mainstream formats as 7Z, RAR, TAR and ZIP to experimental ones like PAQ/LPAQ family, currently the most powerful compressor available. Read (browse, extract, test) 118 file extensions: 7z, bz, bz2, bzip2, tbz2, tbz, gz, gzip, tgz, tpz, tar, zip, z01, smzip, arj, cab, chm, chi, chq, chw, hxs, hxi, hxr, hxq, hxw, lit, cpio, deb, lzh, lha, rar, r01, 00, rpm, z, taz, tz, iso, jar, ear, war, lha, pet, pup, pak, pk3, pk4, slp, [Content], xpi, wim, u3p, lzma86, lzma, udf, xar, dmg, hfs, part1, split, swm, tpz, kmz, xz, txz, vhd, mslz, apm, mbr, fat, ntfs, exe, dll, sys, msi, msp, ods, ots, odm, oth, oxt, odb, odf, odg, otg, odp, otp, odt, ott, gnm, doc, dot, xls, xlt, ppt, pps, pot, docx, dotx, xlsx, xltx, swf, flv, quad, balz, zpaq, paq8f, paq8jd, paq8l, paq8o, lpaq1, lpaq5, lpaq8, ace, arc, wrc, 001, pea, cbz, cbr, cba, cb7, cbt.